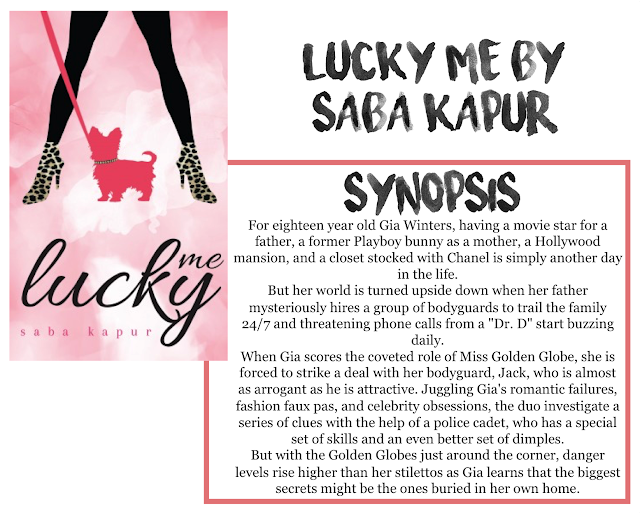 I am back this week with another blog tour for the soon to be released debut of Saba Kapur, Lucky Me. and this one is very special because I have the wonderful opportunity to give away a copy of this book to one of you! I'll get into those details a little later. Before I get to my review, let's do a little Q&A with the author, Saba Kapur! What inspired you to write Lucky Me? Where were you when the idea came to you? When did you decide to write it? The idea for Lucky Me actually came to me in the shower! I was in tenth grade, and had been spending a lot of time in the library. High school drama was at its peak, and I found my solace amongst books. I think that’s where most of my urge to write came from. This idea just popped into my head and I typed up a rough first chapter, and decided to continue from there. I never wrote it with the intention of having it published; it was initially just a hobby. The idea for the book developed from various places. I had noticed that, particularly amongst my generation, the focus on young celebrities was growing in Hollywood, which really intrigued me. I wanted to write something that was funny but also had an element of mystery, as those are my favourite kinds of books to read. What was your writing process like? Did you know the entire plot of the story before you began or did you come up with it as you wrote it? When I began writing the book, I had very little of the story worked out in my head. Many of the characters, such as Milo, were a result of impromptu decisions while writing a chapter! But because I began writing the book when I was so young, overtime my writing style matured, and I wasn’t happy with the story. I must have rewritten the plot a million times before settling on the final draft! I was very reliant on my sister and my friends during this time, as they really helped me shape the story with more clarity and finesse. What authors do you look up to and why? mastered the art of mystery, humour and romance. Do you plan to write a sequel? I am currently working on the sequel! Lucky Me ended with a few unanswered questions, and I just felt that I couldn’t fit it all into one book without taking away from the main story. I always intended on writing another book, and I’m having so much fun exploring what’s next in Gia’s life, now that she’s graduating from high school. I feel like the characters are growing up alongside me. Thanks so much to Amberjack Publishing and the author for sending me this book for review and blog touring (is that a word?). All opinions are my own. This was such a great book! I wasn't too sure about it at first, but it had me hooked from the first chapter! This book really was so much more than I was expecting, it was hilarious (like I was literally laughing out loud like a lunatic), witty, and at some points, terrifying! Anyways, the thing that really surprised me about this book was the mystery aspect. It wasn't some fluffy little "ooh I'm a celebrity's kid, someone is prank calling me," it was legitimate, I was afraid. And I wasn't expecting that. The whole stalking turns into something quite well thought out and I really enjoyed it! I'm still not 100% on board with the final reasoning, but it suited me well enough. While this book does wrap up most of the details of the story, i.e. motive, final relationships, etc., there definitely is room for another book, and some of the mystery hasn't been fully wrapped up yet. I can only imagine where this story will go and I look forward to reading book two. I highly recommend this book if you love any or all of fashion, mysteries, hilarity, and/or witty characters. Or even if you are just looking for a little something different. Okay, so now for the giveaway! The publisher was kind enough to offer to giveaway one paperback copy of this book, and I can guarantee you are going to want to enter this giveaway! The giveaway will run from the time of this post being live to April 4. I will be randomly choosing the winner and announcing it on this blog post and my Instagram at some point shortly after that. Good luck!